“Good boy!” TrendMedia and GuideDogs.com win the Web Marketing Association’s 2007 Non-Profit Standard of Excellence Award for Outstanding Achievement in Website Development. Wow, that’s a mouthful. Bottom line, it was a fun project to work on and at the end of the day one of those projects that really makes you feel good about what you do. Three cheers for accessibility and a big tail wagging congratulations to everyone at Guide Dogs for the Blind for their efforts in creating such a great resource for the blind and visually impaired community. Award well deserved. 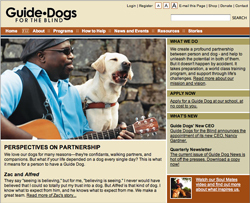 Learn more about the Guide Dog’s web project on Brian McNitt’s Blog — Guide Dogs, TrendMedia, Accessibility in News. This entry was written by Brian McNitt, posted on at 9:38 pm, filed under Life, Web Development and tagged accessibility, blind, dogs, guide dogs, mcnitt, trendmedia, usability, web. Bookmark the permalink. Follow any comments here with the RSS feed for this post. Post a comment or leave a trackback: Trackback URL.